After 8 months off (building up his brawn by slugging around a growing infant), our consultant Peter is back with us at the Cathexis office. 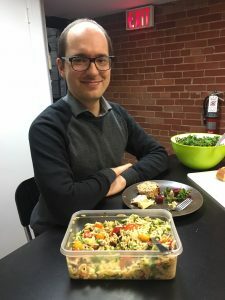 We all know the key to Peter’s heart is through his stomach, so the team held a potluck celebration in his honour. Peter is thrilled to return to writing literature reviews, creating evaluation plans, and eating leftovers in our fridge with great gusto.